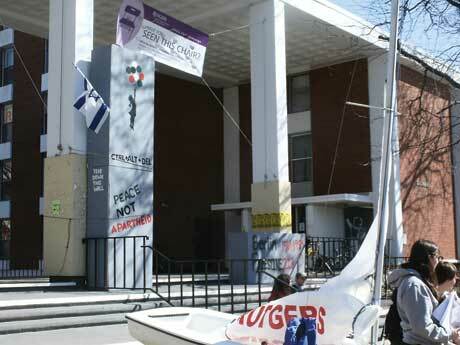 It was a tough year for friends of Israel on the Rutgers campus. But last Tuesday night, at the Rutgers Hillel Gala held in Livingston, student activists got a warm reminder that they don’t stand alone as community leaders from all corners of the state came out to support the 68-year-old campus organization. Local students spotlighted include Sam Weiner of Paramus, who was one of the masters of ceremonies for the evening, and two of the undergraduates who received “Student Rising Star” awards: Mariya Badu of Fair Lawn and Raffi Mark of Wayne. 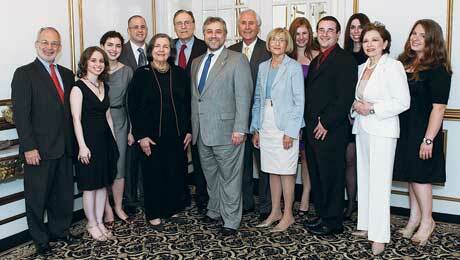 Michal Greenbaum, originally of Teaneck, who graduated in 2007, received Hillel’s first Young Alumni Award. Highlighting the connection between the campus community and the established Jewish community was the leadership award given to Leonard and Ruth Cole of Ridgewood. Ruth Cole is president of the New Jersey Association of Jewish Federations, which is funding Hillel’s battles on behalf of Israel on campus. (See related story.) Leonard Cole is chair of the Birthright-Israel Committee of the Jewish Federations of North America and a faculty member at Rutgers, where he is an expert in bioterrorism and terror medicine on the faculty of the Division of Global Affairs. Mark, along with Liran Kapoano of Highland Park, presented a program entitled Fighting the Delegitimization of Israel on Campus. One such event, co-sponsored by pro-Palestinian group BAKA (Belief, Awareness, Knowledge, Activism) and IJAN (the International Jewish Anti-Zionist Network), was entitled Never Again for Anyone. The premise of the event was that the treatment of the Palestinians by the Israelis was equivalent to the treatment of Jews and other political prisoners of the Nazis during the Holocaust. It was advertised as “free and open to the public,” and so as a response Hillel organized a silent protest. Several students planned to sit in the front rows of the event wearing yellow shirts that said “Don’t Politicize the Holocaust” and, during one of the pro-Palestinian speeches, stand for a moment of silence before exiting. The event caught the attention of Jewish leaders from surrounding communities, and almost 400 people showed up to protest. Seeing that they were outnumbered almost three to one, the cost of admission, which previously was a suggested donation, suddenly became mandatory. The protest was thus held outside the event’s doors. Hillel was on the front lines crafting responses to each anti-Israel event as it came up, as well as creating new pro-Israel programs to bring the community together. During Apartheid Week, Hillel set up a booth near BAKA’s apartheid wall and handed out cake with an Israeli flag design in the icing, as well as pamphlets, Israeli candy, and snacks. The overall feeling from the group was that the pro-Israel side attracted far more passers-by than the wall. There were also many pro-Israel events that were not reacting to anti-Israel sentiment. For instance, IsraelFest, held just a few days before RutgersFest, included a large inflatable rock wall labeled Masada for anyone who wanted to climb. Participants left with bags and sunglasses labeled IsraelFest, as well as pamphlets and other sources of information on the Jewish state. In addition to its pro-Israel activities, Hillel also is a resource for many Jewish religious and cultural events and activities, such as Birthright trips, ASB (Alternative Spring Break) trips to Guatemala, Israel, and New Orleans, and programs for freshmen to get acquainted with one another and Hillel. Badu’s description of her experience with Hillel exemplifies the role of the organization in forging Jewish identity among students. Anti-Israel graffiti on an “Israeli apartheid wall” set up on Rutgers campus.